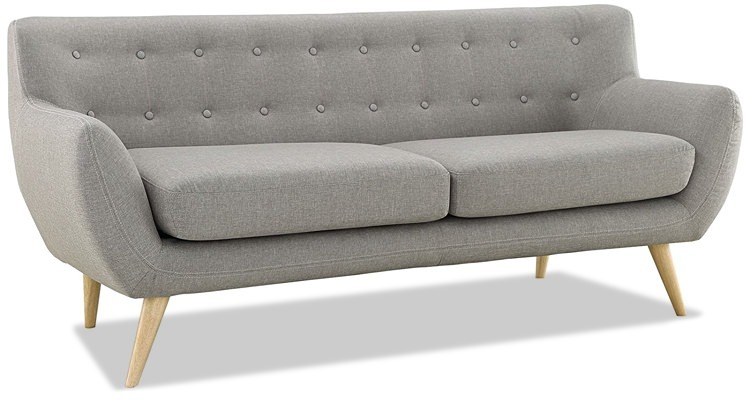 Well-Built, Affordable Couches Under $900 | Valet. It's one of the most important pieces in your home. You probably spend as much time on your sofa as you do in your bed (maybe more). But unlike your mattress, your sofa also serves as a major design element in your living room. So it not only needs to be comfortable and durable, but it should also be good looking and functional to your needs. And while choosing a couch is easier if you've got three grand to drop, you don't have to spend too much to find one that's attractive and well-built. Herewith, six current options that will suit a range of decor styles. 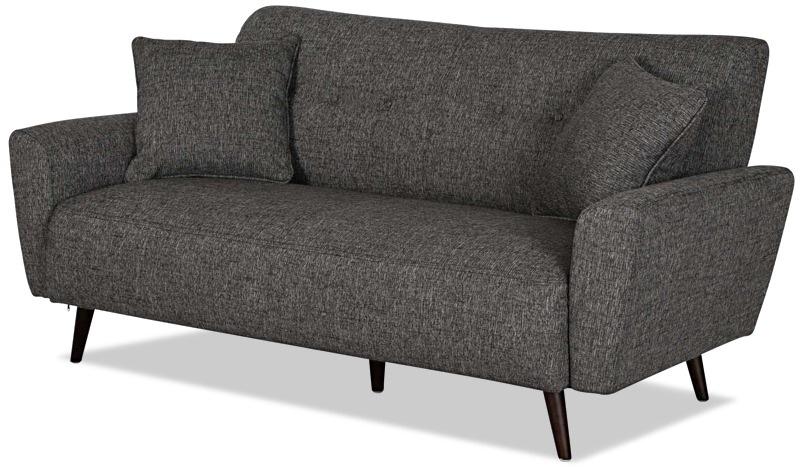 With its uniquely mid-century modern style and natural wood legs, this upholstered button-back sofa looks like something from a Danish design store. This textured cotton couch has all the hallmarks of a Chesterfield, like a tufted back with rolled arms and wooden bun feet, but the proportions have been slimmed down for today. We really like the Easton's streamlined silhouette. The single seat cushion, round bolster pillows and tapered walnut stained legs give it a sleek, sophisticated (read: expensive) look. 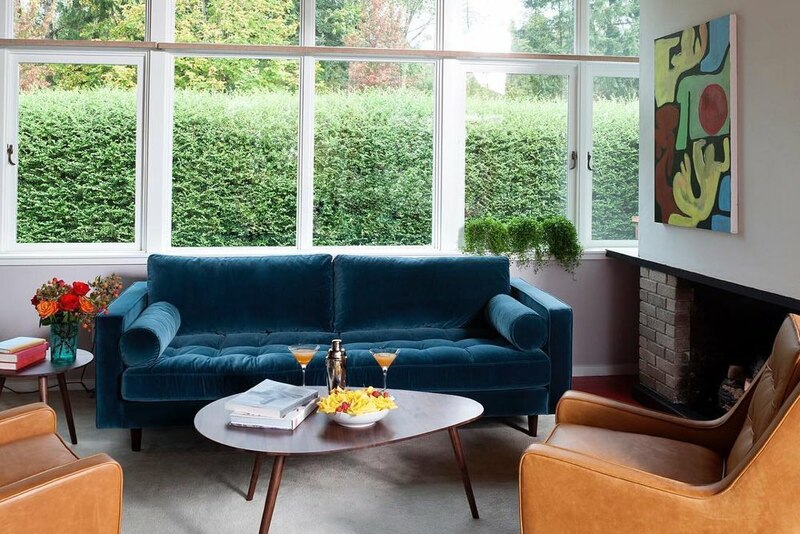 Definitely not a style for everyone, this low-slung sofa with its soft curves and velvety upholstery, takes inspiration from the swanky Italian designs of the 1970s. When you've got a small apartment or cramped living room, you want furniture that fits proportionally but doesn't look tiny. The tailored lines and overstuffed cushions (plus two matching pillows) of this couch do just that. $699 by Dania Furniture Co. This long, lean sofa features crisp, contemporary angles and stainless steel legs. Though the cushions are slim, they're made from high density foam with a cushy filling. Is this a crash couch for lounging and movie watching? Do you entertain a lot and need space for at least four people? Or are you looking for more of a design piece that you'll occasionally sit on? Do you lean towards more modern, minimalist styles or are you drawn to more traditional and eclectic designs? The sofa, as the largest piece, will dictate the aesthetic of a room, so make sure it plays well with the rest of your furniture. Woven cotton is a safe bet. It's comfortable and textured but not distracting. Velvet is a swanky choice that actually looks more subdued once it's in your place. Leather is an option, but only if it's real and the sofa is a more classic shape. A neutral shade is versatile and can be built upon by adding a few patterned pillows or a colorful throw blanket. While a sofa covered in a bold color can be the focal point of a room and add a nice contrast to your space. 10 of the coolest pieces to put up (without going broke).